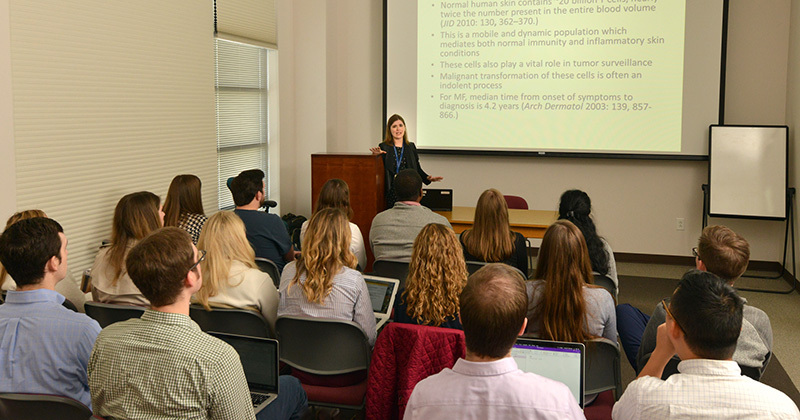 The next annual melanoma conference will be scheduled for March 22, 2019 at the Friday Center, Chapel Hill, N.C. Check here for details. Hope for HS is a support group with multiple chapters nationwide that aims to provide support for patients and their loved ones affected by HS. The NC Triangle group has a heavy online presence and meets in person at the UNC Dermatology clinic on an alternating basis with Duke Dermatology every other month. Educational presentations on rotating topics are given at the beginning of each meeting and the remainder of each session is focused on discussions with patients helping to direct the conversation. Physicians are present at each meeting to make sure the information presented is accurate. For additional details see https://www.facebook.com/HopeForHS/ or http://hopeforhs.org/nctriangle. The next meetings are March 20, 2019 and July 24, 2019. Parking is available in front of our building as well as the 2-level parking garage, behind our building. Patient viewing starts at 4:00 p.m. in the Dermatology Clinic on the second floor at 410 Market Street, Suite 400, at Southern Village. The presentations are held in the Southern Village Dermatology Clinic Conference Room, on the first floor in Suite 314. These begin promptly at 5:00 p.m. and end by 6:00 p.m. Parking is available either right outside the building off Market Street, or in the parking garage at the rear of the building, taking a right at Rasa Malaysia Restaurant (which is next to UNC Dermatology) and another right at the rear of the building to enter the garage. Attendees wishing to receive 2 hours of CME credit for attending the UNC/Duke conferences should bring their green card to the program, complete the card and give it to the conference director. The UNC/Duke conference number is 159100. Patient viewing takes place from 4:00-4:50 p.m. in clinic 3K, Duke South. Presentations will follow from 5:00-6:00 p.m. in the Alban Barrus Conference Room (#3031). Attendees wishing to receive 2 hours of CME credit for attending the Duke/UNC conferences should bring their green card to the program, complete the card and give it to the conference director. The Duke/UNC conference number is 062200.